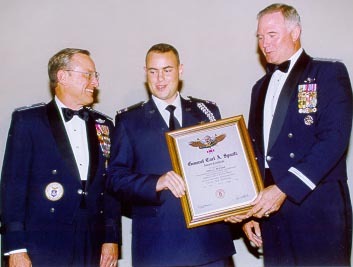 Georgia Wing’s James McCloud was presented Spaatz Award #1376 at the 1998 National Board Meeting in Atlanta, Georgia, where he served as the National Commander’s cadet Aide-de-Camp. C/Col McCloud received his award from USAF Chief of Staff General Michael E. Ryan (right) and CAP National Commander Brigadier General James C. Bobick. C/Col McCloud has since become a CAP senior member, and currently is a senior at the University of Florida majoring in Business Administration. He will be commissioned as an Air Force Second Lieutenant in June 1999 and will attend Undergraduate Air Battle Manager training at Tyndall AFB.